In the Pajaro Valley, residents share a unique kinship with corn. In the Mayan creation story, El Popul Vuh, the people are made from corn by the creator. Families in our community grow corn from their homelands in their front yard. Many people immigrated to the Pajaro Valley after the U.S., Canada, and Mexico created polices instigating the massive dumping Genetically Modified corn on the Mexican market. This displaced millions of farmers from the countryside as they could not compete with cheap, imported corn. This is why for the Pajaro Vally in particular, enthusiasm around Proposition 37 is so strong. 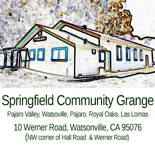 Join us for a special bilingual film festival at the Springfield Grange (located at the corner of Werner and Elkhorn Roads just outside of Pajaro, CA). These films focus on the impacts of GMOs on people and communities in Mexico and throughout the world. A panel of local experts, including an environmental scientist, a farmer, a farmworker, and a small, local GMO-free tortilla business will be present to discuss their perspectives on GMOs and the possibilities for change presented by Prop. 37. Free Admission. GMO-Free Snacks available for Sale. This entry was posted on September 24, 2012 by dveraisaxton in News.